Even though my birthday was almost a month ago now, there was a funny episode that I probably won’t forget for a while – and neither will my friends. I am someone who LOVES birthdays. I love planning parties, surprises, and getting cake and treats for others. Birthdays are special and unique and I think they should be celebrated. I know often people don’t enjoy their birthday because they don’t want attention and feel they’ve done nothing to deserve it. But I disagree, I think people should celebrate who they are – who God has made them to be. To remember the blessings and hardships of the past year, thank God for His grace, and look ahead with hope to whatever is next. When it comes to my birthday I feel the same. I love being celebrated and feeling special. I love feeling loved! I don’t think its necessarily narcissistic or prideful to feel such things on your birthday. Especially because God loves us, and wants us to know that. He wants us to feel loved, treasured, valued and adored. But despite all the birthday fun, I’m terrible with surprises. In fact I really despise them during the rest of the year! I always thought I would LOVE surprises – and then when people try to surprise me I get angry. You can add that to the list of weird and unusual things about me. But I like control, I like knowing what’s going on. I LOVE planning surprises for others, but I hate receiving them. So this year my birthday was really fun but fairly low key. I had a wonderful breakfast with my mom in the morning and then I spent most of the day in Hamilton with my friends. We walked around the downtown stores and then toured Dundurn Castle, which was marvelous and lots of fun! We came back to Guelph and then we served downtown at a Saturday night dinner that my church was hosting. It was great and tons of fun and some of my other friends joined us there. Afterwards we decided to go back to my friends house to hang out and maybe play some games. But, we realized that we needed to get chips and salsa so we had to make a stop a Zhers. Now my friends were thinking, oh Erin will just go in and buy the chips and salsa and then come straight out. We can trust that she can go into the store by herself. But when I went into the store I started to think about how much I love cake (which my friends know). And it would be so cute to have a little cake that we could all eat! I know Zhers has little cute cakes for only $10, and so I thought I should get one so that we could all eat cake. My friends were so low key that I didn’t think they would get me a cake – and it was my birthday! I wanted cake. So I bought it. 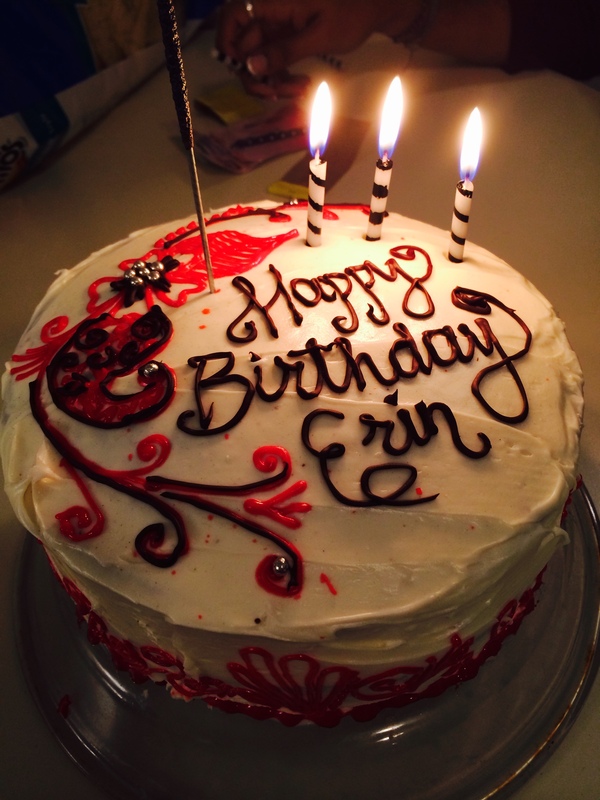 And my friends were mad – they thought it was stupid that I would buy a cake for myself on my birthday. I thought the cake was cute. Little did I know that my friends were surprising me with another cake. One they had made themselves – and decorated. My friend Kathryn who made it, does henna and piped the icing and it was GORGEOUS. It was so much better than my $10 cake! It had a sparkler in it, and those pearl cake decorations. It was so beautiful. And I felt so stupid. I thought my friends wouldn’t make me a cake, so I went ahead and got my own. And then I realized how often is the case in my relationship with God. I rarely trust that He will provide for me. That He will work in my life. When I don’t see Him doing these things I tend to not trust that He’s there behind the scenes. Then I usually forge ahead and do things on my own. But just like my cake, God’s plan for my life far exceeds anything I could ever create. My attempts at providing for myself are never as great, as when I trust God to lead and direct. 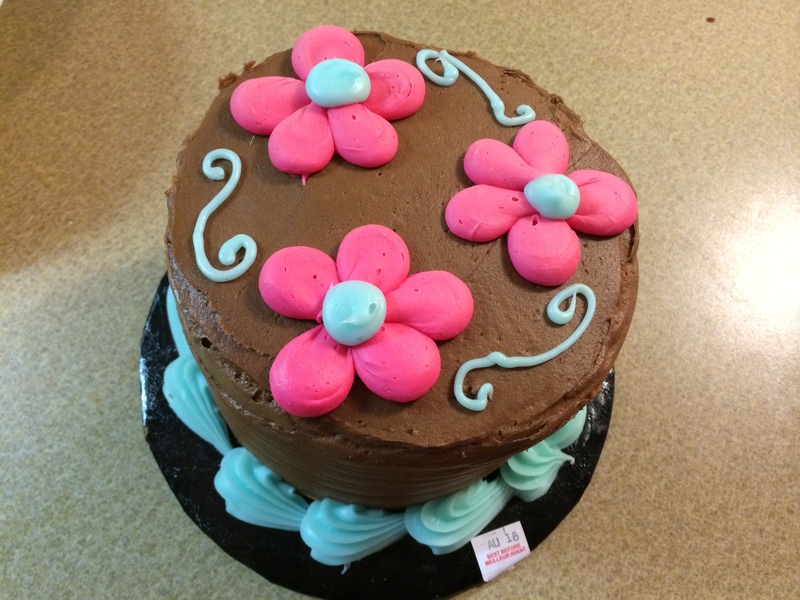 When I bought my own birthday cake, it revealed how my heart so often fails at trusting God. Thankfully I have loving and amazing friends that made me a beautiful cake, and a loving and amazing God who graciously provides all of my needs. That at least is something worth celebrating.